An ectopic pregnancy, or eccysis, is a complication of pregnancy in which the embryo implants outside the uterine cavity. With rare exceptions, ectopic pregnancies are not viable. Furthermore, they are dangerous for the mother, since internal haemorrhage is a life-threatening complication. Most ectopic pregnancies occur in the Fallopian tube (so-called tubal pregnancies), but implantation can also occur in the cervix, ovaries, and abdomen. An ectopic pregnancy is a potential medical emergency, and, if not treated properly, can lead to death. In a normal pregnancy, the fertilized egg enters the uterus and settles into the uterine lining where it has plenty of room to divide and grow. 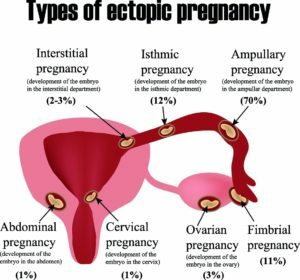 About 1% of pregnancies are in an ectopic location with implantation not occurring inside of the womb, and of these 98% occur in the Fallopian tubes. Detection of ectopic pregnancy in early gestation has been achieved mainly due to enhanced diagnostic capability. Despite all these notable successes in diagnostics and detection techniques ectopic pregnancy remains a source of serious maternal morbidity and mortality worldwide, especially in countries with poor prenatal care. In a typical ectopic pregnancy, the embryo adheres to the lining of the fallopian tube and burrows into the tubal lining. Most commonly this invades vessels and will cause bleeding. This intratubal bleeding hematosalpinx expels the implantation out of the tubal end as a tubal abortion. Tubal abortion is a common type of miscarriage. There is no inflammation of the tube in ectopic pregnancy. The pain is caused by prostaglandins released at the implantation site, and by free blood in the peritoneal cavity, which is a local irritant. Sometimes the bleeding might be heavy enough to threaten the health or life of the woman. Usually this degree of bleeding is due to delay in diagnosis, but sometimes, especially if the implantation is in the proximal tube (just before it enters the uterus), it may invade into the nearby Sampson artery, causing heavy bleeding earlier than usual. If left untreated, less than half of ectopic pregnancies will resolve on their own. These are the tubal abortions. The advent of methotrexate treatment for ectopic pregnancy has reduced the need for surgery. Laparoscopic surgery might be required should methotrexate treatment be unsuccessful or in danger of rupturing. Should your fallopian tube rupture and there is the danger of bleeding out; a more invasive procedure, known as a laparotomy, would need to be performed to stop the bleeding.